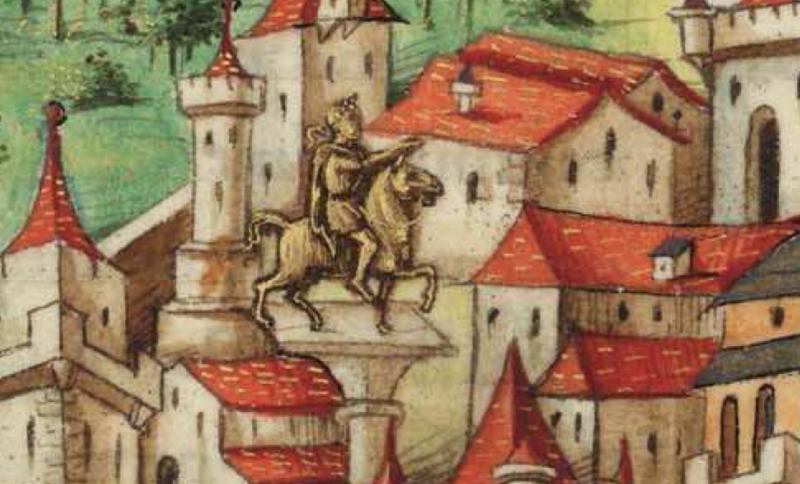 What struck me at once was the prominent view of the column of Justinian, complete with the equestrian statue of the emperor pointing towards the east. The column stood outside Hagia Sophia, and was destroyed by the Turks after they took the city. But where does this come from? A little searching revealed that it comes from the 15th century Madrid copy of the Notitia Dignitatum, Matritensis Reserva 36, Biblioteca Nacional de Madrid, which is online here and in the catalogue as the “Descriptio orbis terrarum”. The pages may be downloaded individually. There are, indeed, quite a number of interesting texts in this manuscript. 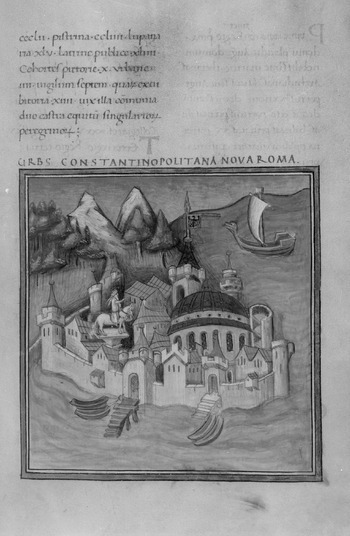 This image is on folio 84r, which is page 185 in the online facsimile, at the start of a text labelled “Notitia urbis Constantinopolitanae”. The Notitia Dignitatum itself follows somewhat later. So this is a collection of late Roman documentary texts describing the cities, and the late Roman military organisation. Sadly the image online is not as high-resolution as one could wish, as an attempt to zoom in reveals. This is a shame. I’d have liked a clear view of the statue’s hat. This comes from Bodleian Library, Ms. Canon. Misc. 378, fol. 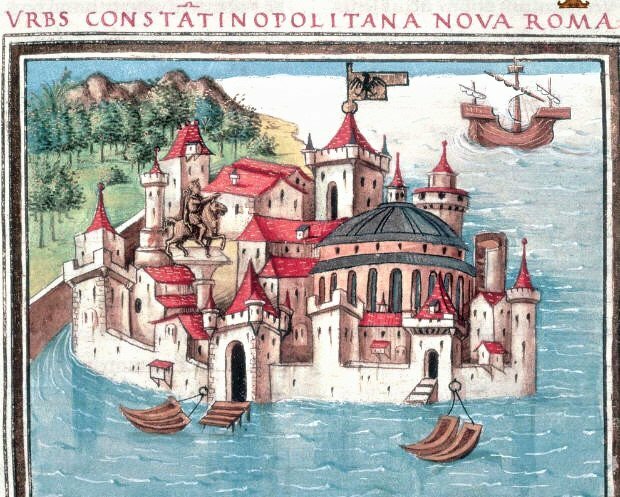 84r., via Boeck, Imagining the Byzantine Past, “7.Constantinople: story spaces or storied imperial places” p.244. It is really remarkably similar. Fascinating to see, all the same. These manuscripts were created at a time when the column and the statue still stood. I applaud your perseverance , Roger, in the face of all difficulties, we bloggers, find, not least from the amout of indifference of many to what we spend huge efforts to bring to the attention of the public, some reaching a high level of scholarly work. Carry on the good work. I think that one has to blog for oneself, not for any reward. I do it because I want to! I read, variously: eutucho exro, aiar, cheimon, while the topmost is too blurry for me! (something about ‘having luck’, ‘the Great Mother [Aia]’, and ‘winter’?, I burble…). I could well be wrong, but I see it as a laurel wreath, not a hat. Interesting thought! Maybe it was! Well done, RP… Thank you for your sharp eye. Not meant to dissuade you, Roger, from writing. I just envy you and blame myself for sometimes giving up. No hassle! Selfishness is a key element in blogging. I’m very lucky to have readers who want to read what I feel like writing. Regarding the mosaic in southern Anatolia (six comments above), I cannot make out the top inscription either, but on the left I read ΑΙΑΡ (i.e. ἔαρ, spring), on the right ΧΕΙΜΩΝ (χειμών, winter), and below ΕΥΤΥΧΩΣ ΧΡΩ (εὐτυχῶς χρῶ, use fortunately). The last, it seems, is common in inscriptions (the equivalent of the Latin feliciter utere), and is obviously appropriate for the fruit of the vine, for which this seems to be the autumn illustration. The orthography casts doubt on the dating of the mosaic, as confusion of αι and ε is unlikely before c. 150 A.D.
Interestingly no image shows a cross above the Church of Holy Wisdom. In fact the black and white image from the Bodleian manuscript shows the Muslim crescent while still displaying the Byzantine embelem! Not sure how that came to be. I’m wondering if readers of this page have any insights or comments regarding this aspect of Justinian law. My many belated thanks, too!